This is the last of the Native food plants of [continent] series. Thank you for reading. Here are some of the plants that originate on the South American continent, the ones that I have grown. There are so many that I can only talk about a few. South America is the native home of so many of our fruits and vegetables, like tomatoes, peppers, potatoes, tamarillos, avocados, corn and so many more, it is a mecca of familiar and weird food crops. Achira (Canna edulis), also known as Queensland arrowroot. 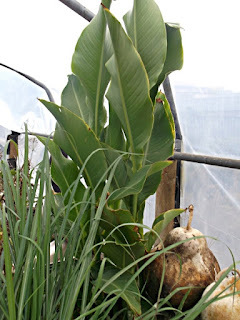 This is the ancestor of the familiar garden canna lily. The roots are used commercially for industrial and culinary starch, but it makes quite a useful food, especially in hard times. I have cooked an eaten it, and liked it. 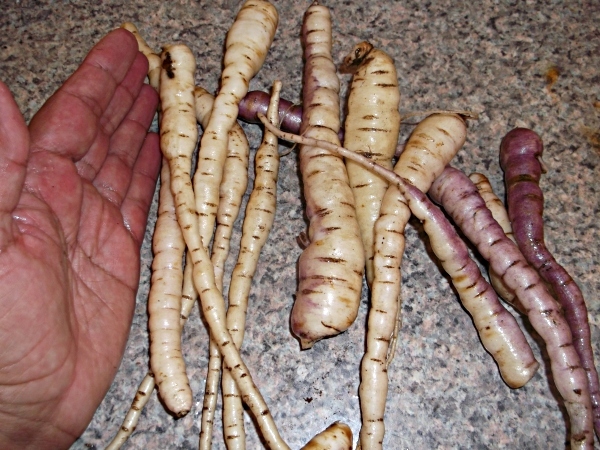 The roots are peeled and baked, boiled or microwaved and have a similar taste and texture to potato. They can be a bit fibrous though. Arracacha (Arracacia xanthorrhiza) is one of my favourites. The roots do grow bigger than this. 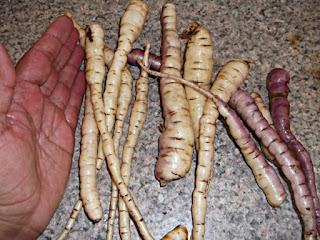 They have a cooked texture like thick and sticky potato, and the flavour of a mix of parsnip, potato and celery. The plant looks a bit like a bushy celery and taks a long time to mature. You plant in spring and harvest the roots the next winter. Another favourite is oca (Oxalis tuberosa). 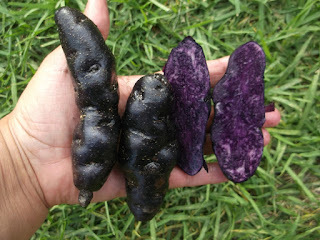 This tuber comes in so many colours. It is fun and fairly easy to grow. The tubers are harvested in winter and have a taste and texture of potato. When dehydrated they go quite sweet and can be eaten like dried fruit. They are related to garden oxalis weed but doesn't go weedy. Yacon (Smallanthus sonchifolius) is a tuberous vegetable that is suited to most growing conditions as long as the soil is well drained. 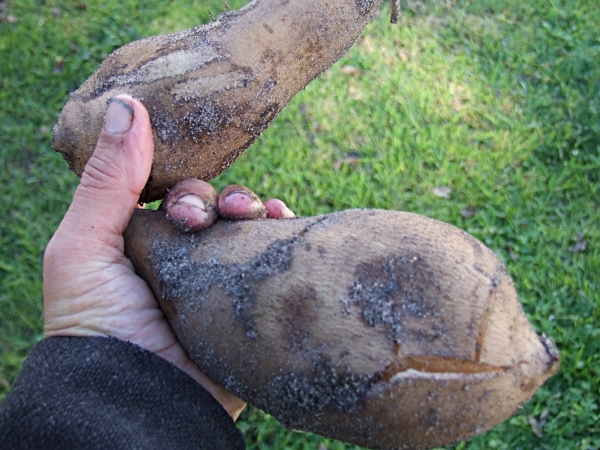 The plants produce large tubers in winter. make sure you leave them to sit for a couple of weeks after harvest in a garage or undercover. They will go very sweet. The juice can be boiled down to produce a sugar syrup. Common vegetables like potatoes, peppers and tomatoes are some of the most fascinating food crops from South America. This family have been bred and selected to form a huge range of colours and types. 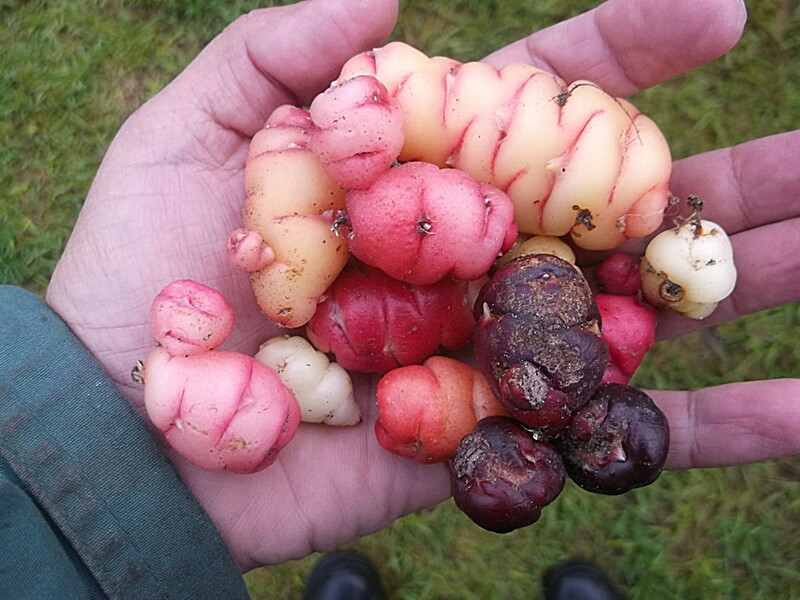 I grow a few types of potatoes and find them fascinating. I hope to release a few new and different varieties in the next few years. There are so many others that I have grown and given up on like Maca and Ulluco, and some others I have a few plants of like Mauka and Mashua. I love the plants of this area. Hi. Have you had any success dealing with red legged earthmites ? No, none. I have to keep spraying. I looked into predatory mites but those available have different life cycles that don't match RLEM cycles so they are not much good with them.